Exciting news of ACJ's exhibition programme for the next two years. 2019 sees Connections/Connessione, a touring exhibition with our Italian sister organisation AGC, plus a members' selling show at a gallery in London. Directors and Advisors met in London to discuss the future of ACJ. You may make a donation in several ways. 1) Send your cheque, payable to the Association for Contemporary Jewellery, to ACJ, PO Box 71338, London SE17 9DY UK. Please add a note stating this is for the Fund. In memory of our Founder member, Findings Editor and Secretary Muriel Wilson, ACJ has set up the Muriel Wilson Fund. This will be used for bursaries to ACJ members to support travel with the purpose of research into contemporary jewellery. The first round of applications resulted in two bursary awards, and articles will be published in Findings. There will be another invitation to apply in January 2020. 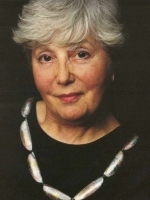 The innovative jeweller Wendy Ramshaw CBE died in December 2018, aged 79. Known especially for her geometric designs and her trademark ring stacks, Wendy's work influenced several generations of UK jewellers since the 1960s. ACJ Director, Rebecca Skeels recently attended the 2018 Triple Parade event (see image). Here’s what she has to say about the event and a few pictures too.